MAHESHVARA the Lord of Knowledge, the god whose intelligence controls the movements of the universe that it created, and that wise men call the Great GOD : the place that concentrates all individualities to make ONE Being, ONE thought. Finally, SHIVA is Kala, the power of time, that uses and destroys, because everything in this world, existence and non-existence, joy and pain depend on time which is also identified with Yama, the ruler of the kingdom of the dead, (the Mahabharata). Shiva, the infinite god, is also considered as the comforter who removes physical pain by mental and spiritual means, using silence and the obscurity of the unconscious, comparable to a night of sleep without dreams. The union of SHIVA (the substance) with Shakti (the omnipresent energy) is the foundation of all creation. In the same way the union of the lingua (Phallus of Shiva), the masculine organ, and of the YONI (the feminine organ), becomes the symbol of the union between time (male) and space (feminine). The religion of the phallus is part of a very ancient ritual that was used by theAssyrians and Egyptians; in particular under Ramses II, who had a very large harem. He used the fertilization of his women to give birth to many warriors, (and therefore a big army). This made a much more secure army for the Pharaoh than using mercenaries! Several goddesses were considered to be the wives of SHIVA, but subsequently Devi or Mahadevi (whose stomach contained the universe) became his main wife. DEVI is also honored under a double aspect: one is DEVI the good wife of Shiva, and the other is KALI the warrior. Rudra is the Lord of tears, because he makes men mourn when a loved one leaves or dies. But Rudra also means the one that removes pain. Shiva is therefore not only the God that destroys life, but as life is born again after death, he is also the one who recreates all life in the world, under new forms. He is part of the Creation Trinity of the world and of life. "He has no beginning, no middle, no end. He is the only ONE, the Omnipresent"
Brahma is a form personifying immensity. The religious sages called "Brahmans" educate the faithful to maintain respect for the traditions and to explain the meaning of them and their symbols to the members of the Hindu religion. Considered from the start as the god that personifies EVERYTHING, he is the: Source of the universe, the Creator, the "Cosmic man". His cult decreased slightly in favor of Vishnu/Shiva, the god with two faces. As wind transports the tides and deserts of sand, Brahma is the Original spirit, the One that transformed the primordial waters; He is in Vishnu and Vishnu is in him. He is the eternal organizing Force, the Great Master of the world, the Lord of the Word, the One that shapes us and helps us to be born again. When the universe is destroyed, Vishnu will sleep floating on the causal ocean. After one day for the gods, (or a billion years for men), Brahma will appear out of the navel of Vishnu. He will create new heavens and new worlds; then rest on a lotus flower in the shape of the earth (there are many allusions to this : Matsya Purana, Mahabharata Vama parvan, Bhagavata Purana). Moreover, does not man have the tendency to consider himself as a god himself, and sufficient to himself, but dangerous to all those that cross him ? In mythology, Brahma has four heads and four faces, and in his four arms holds the Vedas, a scepter, a bow, a begging bowl and the Rigveda. As God the Father he is usually represented as an old man, with a white beard. His home is in the deep forests (Brahma-vrinda), the symbol of the universe. Brahma is often represented as the source of the movement of the cosmos, the breath of life (prana), the wind that moves the primordial waters, and who by the vibration of the waves creates the microcosm that is to the origin of everything. Thus at the heart of the microcosm, vibration becomes breath, the vital breath born of warmth, like the wind. 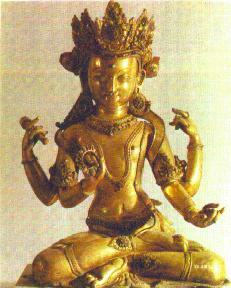 (Hiranya-garbha, Siddhanta). In the Vedas, the Creator is called Progenitor (Praja-pati); later Vishnu and Shiva also received this creative aspect of which Brahma is the original substance. Genesis 1.2 ... God's spirit moved upon the face of the waters; and God said : "Let there be a firmament in the midst of the waters and let it divide the waters from the waters!" These two passages confirm that life came from the WATER. Brahma teaches men the Law of Perfection that permits them to conform to the Cosmic Law. This Law of perfection can not be applied indifferently to all, as each person has a different perception of moral principles. One day and one night of Brahma, the Immense Being, is equivalent to a kalpa divided into 14 portions of time, managed each by a Manu, (a kalpa being equivalent to 8 640 000 years)! According to Hindu texts, we are approaching the end of a Kalpa at the present time, but the final AGE of darkness, the Yuga kali, will not start for several millions of years! The god of eroticism, also called the motor of creation. He was born of himself from the heart of the Immense-Being (Brahma). His wife is called Homage, (Shraddha) or in the Puranas: Desire (Rati or Reva). Their 2 children are : Without-rival (Aniruddha) and Thirst (Tristha). Like Eros, Kama is the god of beauty and youth. In an ancient myth, the gods sent Kama to take Shiva out of his deep meditation, but Shiva was furious and reduced him to ashes. Seeing Rati's tears, Shiva allowed Kama to be born again in the form of Ptadyumna, the son of Krishna. "He who looks for love in the hope of enjoyment is the victim of desire. The wise man accepts sensual pleasures, but not being a victim of desire, he detaches his heart from it." represents the principle of life on Earth, he is the Cosmic life source and the main Progenitor; his very ancient cult is bound to Maya. the ruler of the lower world, he is the king of the dead, or architect of the anti-gods and the god of magicians. These include three kinds of negative spirit: genies, titans or ogres and demons. who represents all the laws and regulations which allow men to live in harmony with each other. who embodies intelligence. He is one of the ten sons born to Brahma. He married Action (Krya), and had 60 000 sons: the wise men who surround the chariot of the Sun.